The Joint Public Issues Team of Baptists Together, the Methodist Church, the Church of Scotland and the United Reformed Church has published a report calling on the government to end the hostile environment it has created towards people who cannot prove their right to live in the UK. Entitled ‘Destitution, Discrimination Distrust: the hostile environment’, it examines the wide-reaching impact of policies designed to make life so difficult for people who cannot prove they have the right to live in the UK that they will choose to leave. It looks at policies that deny people access to housing, banking, employment and healthcare, and that encourage a culture of suspicion. It highlights the impact of these as inflicting destitution and promoting xenophobia. The report provides a Christian response and calls for an end to the hostile environment. Our Christian faith prompts us to pray and work for a society where people are treated justly and in which we are truly hospitable to one another. It encourages people to write to their MP, and offers advice on doing so as well as links to case studies to strengthen the call to action. It asks people to share stories of how the hostile environment affects them, and how churches support those in crisis. Finally it calls on individuals to practice love and extend welcome to all people. 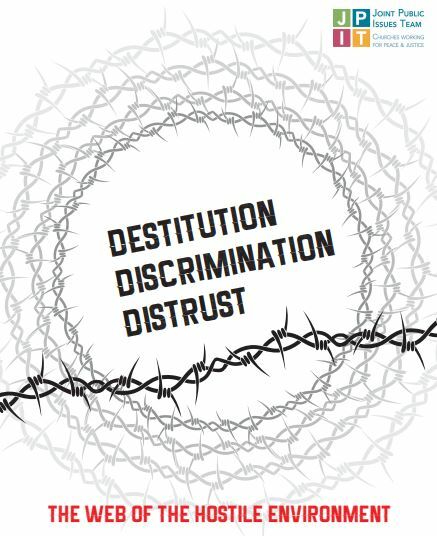 Read the full report on the following link: Destitution, Discrimination Distrust: the hostile environment.